The period from 27 December 2009 to 18 January 2010 marks the first anniversary of Israel's brutal assault against the besieged people of Gaza. The 22-day attack left more than 1,400 dead, the vast majority of them civilians including nearly 400 children, destroyed 3,600 homes and displaced 50,000 people. 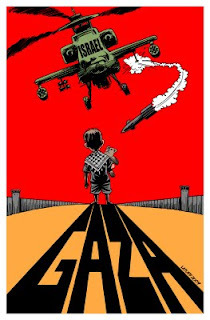 Actions to mark the anniversary include a vigil outside the Israeli Embassy on 27 December (3pm, High Street Kensington, W8), 22 days of 'Waging Peace' in Manchester, Smash EDO's "Remember Gaza" action in Brighton on 18 January, the Viva Palestina convoy, and the Gaza Freedom March.